Lamellarin D (Lam-D) is a hexacyclic pyrole alkaloid isolated from marine invertebrates, whose biologic properties have been attributed to mitochondrial targeting. Mitochondria contain their own DNA (mtDNA), and the only specific mitochondrial topoisomerase in vertebrates is mitochondrial topoisomerase I (Top1mt). Here, we show that Top1mt is a direct mitochondrial target of Lam-D. In vitro Lam-D traps Top1mt and induces Top1mt cleavage complexes (Top1mtcc). Using single-molecule analyses, we also show that Lam-D slows down supercoil relaxation of Top1mt and strongly inhibits Top1mt religation in contrast to the inefficacy of camptothecin on Top1mt. In living cells, we show that Lam-D accumulates rapidly inside mitochondria, induces cellular Top1mtcc, and leads to mtDNA damage. This study provides evidence that Top1mt is a direct mitochondrial target of Lam-D and suggests that developing Top1mt inhibitors represents a novel strategy for targeting mitochondrial DNA. The contribution of mitochondria to cellular functions extends beyond their critical bioenergetics role in the form of ATP production. Indeed, they also control cell death by apoptosis, generate critical metabolites for macromolecular synthesis, and regulate divalent metal pools. Mitochondrial dysfunctions have been linked to a wide range of neurodegenerative and metabolic diseases, cancers, and aging (Greaves et al., 2012). Mitochondria are the only cellular organelle containing metabolically active DNA, other than the nucleus (Chinnery and Hudson, 2013). The mammalian mitochondrial genome (mtDNA) consists of circular DNA molecules with 16,569 base pairs encoding 13 essential polypeptides for complexes I, III, and IV of the mitochondrial oxidative phosphorylation chain. It also encodes indispensable components for mitochondrial translation: 22 tRNAs and two ribosomal RNAs (12S and 16S rRNAs for mitoribosomes). The only noncoding region of mtDNA is a small regulatory region (∼5% of the genome) with critical elements for transcription (promoters for both strands) and replication (origin of replication). Because mtDNA is essential for mitochondria (Chinnery and Hudson, 2013), its targeting with drugs offers potential for new therapeutics, as well as molecular tools to study mtDNA homeostasis and their effects on mitochondria (Rowe et al., 2001; Neuzil et al., 2013; Olszewska and Szewczyk, 2013). Given that mtDNA consists of relatively small DNA circles with bidirectional transcription and replication, and organization in nucleoids anchored to the mitochondrial inner membrane, it is logical to assume that mitochondrial topoisomerases are critical to ensure mtDNA replication and transcription. To date, three topoisomerases have been identified in vertebrate mitochondria: Top1mt (Zhang et al., 2001), Top2β (Low et al., 2003), and Top3α (Wang et al., 2002). Unlike TOP2Β (Low et al., 2003) and TOP3Α, TOP1mt is the only topoisomerase gene coding for a single polypeptide solely targeted to mitochondria (Zhang et al., 2001; Chinnery and Hudson, 2013). In addition to studying Top1mt’s roles in regulating mtDNA replication (Zhang and Pommier, 2008), transcription (Sobek et al., 2013), and mtDNA integrity (Medikayala et al., 2011), it has become possible to examine Top1mt functions genetically. Murine embryonic fibroblasts generated from TOP1mt knockout mice exhibit mitochondrial defects with marked increase in reactive oxygen species production, calcium signaling, hyperpolarization of mitochondrial membranes, and increased mitophagy (Douarre et al., 2012). Topoisomerases relax DNA supercoils by breaking the DNA backbone and forming transient catalytic enzyme-linked DNA breaks, which are referred to as cleavage complexes (Pommier et al., 2010; Pommier and Marchand, 2012; Pommier, 2013). The DNA-damaging effects and therapeutic activity of topoisomerase inhibitors result from the trapping of topoisomerase cleavage complexes by the binding of the inhibitors at the enzyme-DNA interface rather than by catalytic inactivation of the enzymes (reviewed in Nitiss and Wang, 1988; Pommier et al., 2010, 2013). Camptothecin (CPT) and its clinical derivatives (topotecan and irinotecan) kill cancer cells by selectively trapping (poisoning) nuclear topoisomerase I (Top1) (Hsiang et al., 1985; Nitiss and Wang, 1988; Pommier et al., 2010; Pommier and Marchand, 2012). Although DNA topoisomerases are among the most effective targets for anticancer and antibacterial agents (Pommier et al., 2010), no drug has been shown to target mitochondrial topoisomerases, and camptothecins are inefficient Top1mt inhibitors, as they are rapidly inactivated in the mitochondrial pH environment (Burke and Mi, 1994; Zhang et al., 2001; Pommier et al., 2010) and require high drug concentrations to target Top1mt (Zhang et al., 2001; Seol et al., 2012), which otherwise extensively damage the nuclear genome (Hsiang et al., 1985; Covey et al., 1989). The purpose of the present study was to determine whether lamellarin D (Lam-D; Fig. 1A) could poison Top1mt in biochemical and cellular systems. Lamellarins (Bailly, 2004; Pla et al., 2008) are hexacyclic pyrole alkaloids originally isolated from marine invertebrates (genus Lamellaria); they can also be obtained by total chemical synthesis (Li et al., 2011). Lam-D is among the most cytotoxic molecules in the series (Bailly, 2004). Its proapoptotic activity has been associated with the generation of DNA breaks resulting from the trapping of nuclear topoisomerase I [Top1-DNA covalent complexes (Top1cc) (Facompre et al., 2003)]. However, Lam-D has also been shown to directly target mitochondria (Kluza et al., 2006; Ballot et al., 2009; Ballot et al., 2010), suggesting that it may poison Top1mt and could act as a potential drug targeting mtDNA by trapping Top1mt. In this study we investigated the effects of Lam-D on Top1mt using in vitro and in vivo DNA cleavage assays in addition to single-molecule supercoil relaxation measurements. We found that Lam-D indeed inhibits Top1mt by trapping the cleavage complex efficiently, in striking contrast to the inefficacy of CPT. More importantly, our study reveals that Lam-D accumulates preferentially inside the mitochondria and efficiently induces Top1mtcc, resulting in mtDNA damage in treated cells. Lamellarin D induces Top1mt-mtDNA cleavage complexes in vitro. (A) Chemical structure of Lam-D. (B) Comparison of Top1mt cleavage complex sites induced by Lam-D and CPT in a 3′-end-labeled 117-bp oligonucleotide rich in Top1 sites. Lane 1: DNA alone; Lane 2: Top1mt alone; Lane 3: Top1mt + CPT 1 μM; Lanes 4–6: Top1mt + 0.1, 1, and 10 μM Lam-D, respectively. Numbers and arrows on the left indicate cleavage site positions (see Materials and Methods). (C) Lam-D inhibits Top1mtcc religation. The same oligonucleotide was reacted with Top1mt in the presence of 1 μM CPT or Lam-D at 25°C for 20 minutes. DNA cleavage was reversed by adding 0.35 M NaCl and monitored over time. Numbers and arrows on the left indicate cleavage site positions. Mitochondrial Topoisomerase I-Mediated DNA Cleavage Reactions. Human recombinant Top1 was purified from baculovirus as previously described (Pourquier et al., 1999; Seol et al., 2012), and Top1mt was expressed and purified in the same manner. DNA cleavage reactions were prepared as previously reported with the exception of the DNA substrate (Dexheimer and Pommier, 2008). Briefly, a 117-bp DNA oligonucleotide contains a single 5′-cytosine overhang, which was 3′ end-labeled by fill-in reaction with [32P]-dGTP in NEBuffer 2 (New England BioLabs Inc., Ipswich, MA) with 0.5 units of DNA polymerase I (New England BioLabs). For reversal experiments, the addition of SDS was preceded by the addition of NaCl (final concentration of 0.35 M at 25°C for the indicated times). Aliquots of each reaction mixture were subjected to 20% denaturing PAGE. Gels were dried and visualized by using a phosphorimager and ImageQuant software (Molecular Dynamics/GE Healthcare Life Sciences, Pittsburgh, PA). For simplicity, cleavage sites were numbered as previously described in the 161-bp fragment (Pourquier et al., 1999). Generation of 23-kb coilable DNA and sample preparation were done as previously described (Seol et al., 2012). Measurements of supercoil relaxation by Top1mt (50–500 pM) were performed in topoisomerase buffer [10 mM Tris, pH 8, 50 mM KCl, 10 mM MgCl2, 0.3% w/v bovine serum albumin (BSA), 0.04% Tween-20, 0.1 mM EDTA, and 5 mM dithiothreitol (DTT)] with varying Lam-D concentrations (1–10 μM) and DNA twist density (–0.008, 0.008, 0.016, and 0.032). DNA twist density (Tw) is controlled via the force applied on the magnetic bead (Seol et al., 2012). The overall Top1mt activity was measured by tracking the height of the tethered bead at 100 Hz (Seol et al., 2012). The rates of supercoil relaxation by Top1mt were obtained by analyzing the DNA extension change using custom-written software (Seol et al., 2012). The slow relaxation-rate probability was determined by calculating the fraction of rates that were less than 30% of the mean rate obtained in the absence of Lam-D for a given DNA twist density. The religation inhibition probability was quantified from the ratio of futile to productive supercoiling attempts, i.e., the fraction of events for which there was no change in DNA linking-number difference (ΔLk) when the magnets were rotated. Confocal Microscopy in Live Cells. Human skin melanoma cells (SK-MEL-5) growing on chamber slides (Nalge Nunc International/Thermo Scientific, Rochester, NY) were incubated in medium containing 100 nM MitoTracker Red 580 (Molecular Probe, Eugene, Oregon) at 37°C for 1 hour. Lam-D (1 μM) was added and fluorescent signals were accessed after 5–30 minutes under confocal microscope (Zeiss 710). Images were collected and processed using the Zeiss AIM software and fluorescence quantification was performed using ImageJ software. Detection of Top1 and Top1mt Cleavage Complexes by Immuno Complex of Enzyme Bioassay. Cells (5 × 105 per well in six-well plate) were grown for 1–2 days (70–80% confluence). After treatments, cells were lysed by adding to each culture well 0.6 ml of lysis buffer (6 M Guanidinium Thiocyanate, 10 mM Tris-HCL, pH 6.5, 20 mM EDTA, 4% Triton ×100, 1% sarosyl, and 1% DTT). Lysates were transferred to Eppendorf tubes and mixed with 0.4 ml of 100% ethanol. After incubation at –20°C for 5 minutes, tubes were centrifuged for 15 minutes. Supernatants were discarded and pellets washed two times with 0.8 ml of 100% ethanol. Pellets were dissolved in 0.2 ml 8 mM NaOH (freshly made) and sonicated for 10–20 seconds at 20% power. For immunodetection, equal volumes and concentrations of isolated DNA were transferred to 96-well plates and serially diluted with 8 mM NaOH. At least 100 μl of DNA solution were applied to polyvinylidene difluoride membranes with a slot blot apparatus. After 1 hour blocking with 5% milk in PBST (phosphate-buffered saline, Tween-20 0.1%), membranes were incubated overnight with Top1mt antibody (Douarre et al., 2012) or (nuclear) Top1 antibody (#556597; BD Biosciences, San Jose, CA) (Antony et al., 2007). After three washes in PBST, membranes were incubated with horseradish peroxidase–conjugated goat anti-mouse (1:5000 dilution) antibody (Amersham Biosciences, Piscataway, NJ) for 1 hour and washed three times. Immunoblots were detected using enhanced chemiluminescence detection kit (Thermo Scientific, Rockford, IL). Induction of Top1mt Cleavage Complexes by Lamellarin D.
To determine whether Lam-D could target Top1mt, we tested cleavage complex formation with recombinant Top1mt using a 117-base-pair 32P-3′-end-labeled DNA oligonucleotide substrate (Zhang et al., 2001; Antony et al., 2007). Figure 1 demonstrates the induction of Top1mt cleavage complexes by Lam-D. The cleavage sites were common to those trapped by CPT. Yet, Lam-D showed differential intensity at some sites (such as sites 70 and 106 in Fig. 1), which is most probably related to the structural difference between the polycyclic ring drug structures that intercalate at the break sites (Stewart et al., 1998; Ioanoviciu et al., 2005). These results demonstrate that Lam-D can effectively target Top1mt cleavage complexes at submicromolar concentrations. 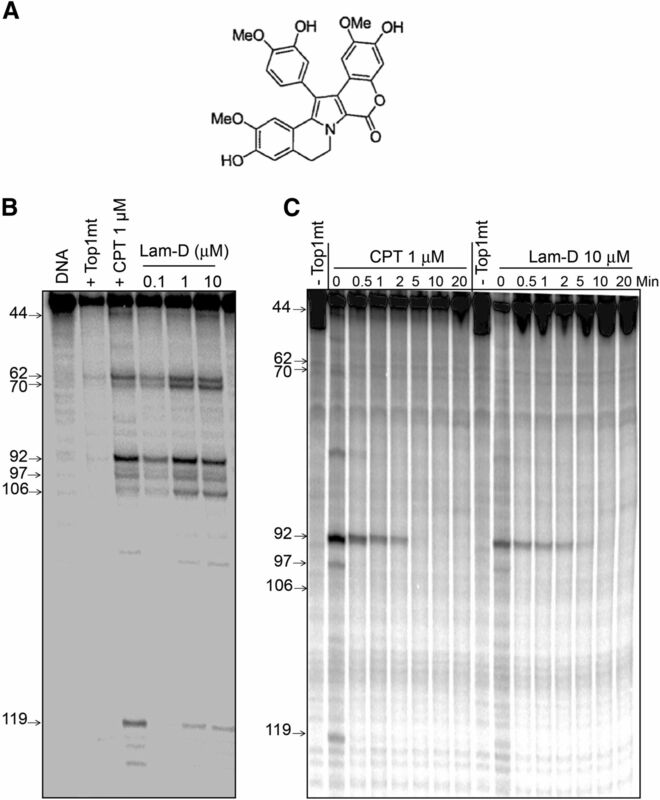 Lamellarin D Inhibits Top1mt Cleavage Complex Religation and Supercoil Relaxation. To determine whether Lam-D enhances Top1mt cleavage complexes by inhibiting DNA religation, we first measured the reversal to Top1mt cleavage complexes after addition of salt, which shifts the nicking-religation activity of Top1 toward religation (Tanizawa et al., 1994). To do so, we followed the reversal kinetics of site 92 (Fig. 1C), using CPT as positive control as it is known to enhance Top1 cleavage complexes by religation inhibition because of its binding at the Top1-DNA interface (Hsiang et al., 1985; Tanizawa et al., 1994; Stewart et al., 1998; Ioanoviciu et al., 2005). The religation kinetics of site 92 was similar for Lam-D and CPT indicating that Lam-D traps Top1mt and inhibits religation. In line with this, we performed single-molecule measurements of Top1mt to test the effect of Lam-D on supercoil relaxation activity (Fig. 2A). The single-molecule supercoil relaxation assay has proven to be a useful tool to test the efficacy of topoisomerase inhibitors, since individual steps in the topoisomerase reaction cycle and changes in these steps upon inhibition by topoisomerase inhibitors such as CPT can be monitored in detail (Koster et al., 2007; Seol et al., 2012). Lamellarin D inhibits Top1mt cleavage-complex religation and hinders supercoil relaxation as determined by single-molecule analysis. (A) Top panel: Schematic of the single-molecule assay with the 23-kb DNA tether (blue), 1-μm magnetic particle (brown sphere), and recombinant Top1mt (red). Bottom panel: example trace of Top1mt supercoil relaxation, which is observed through an increase in DNA extension (blue arrow). Brown lines represent the mechanical coiling of DNA. The resulting extension change is shown by dashed lines. Relaxation rates were quantified by a linear fit over the region where DNA extension increases (blue dashed lines). (B) DNA supercoil relaxation by Top1mt in the absence (top panel) or presence of Lam-D at 1 μM (two middle panels) and 10 μM (bottom panel). Lam-D interaction with Top1mt resulted in periods of slow supercoil relaxation (red dashed lines) and periods of religation inhibition (indicated by red arrows). (C) Quantification of religation (top panel) and slow relaxation probabilities (bottom panel) under varying conditions of DNA supercoil twist density and Lam-D concentration. In our assay, a 23-kb DNA tether was formed by attaching one end of the DNA to the surface of a flow cell via multiple digoxigenin-antidigoxigenin linkages and the other end to a 1-μm magnetic particle via multiple biotin-streptavidin linkages. By rotating small magnets above the flow cell, the DNA can be supercoiled (change in linking number: ΔLk), resulting in a decrease in the extension as plectonemes form in the DNA (Fig. 2A). Supercoil relaxation by Top1mt was observed through the increase in DNA extension. Relaxation rates were quantified by a linear fit over the region where DNA extension increases. To determine the effects of Lam-D on Top1mt, we performed DNA supercoil relaxation assays with Top1mt under varying concentrations of Lam-D (0–10 μM) and Tw (–0.008, 0.008, 0.016, and 0.032). Varying Tw allows us to investigate the effect of Lam-D for different topological states potentially present in vivo. We observed two aspects of Lam-D effect on Top1mt activity: a significant decrease in supercoil relaxation rate (Fig. 2B), which was identified as one of the signature effects of CPT on nuclear topoisomerase (Koster et al., 2007), and religation inhibition, i.e., events for which the DNA could not be supercoiled upon rotating the magnets (Fig. 2B). We quantified the effect on Top1mt attributable to Lam-D by calculating the probabilities of religation inhibition and slow-relaxation rate (see Materials and Methods). As shown in Fig. 2C, the religation inhibition probability generally increased as DNA twist density increased, whereas the probability of slow relaxation was more pronounced at lower twist density, indicating that Tw modulates the effect of Lam-D on Top1mt (Gentry et al., 2011). Surprisingly, the degree of Top1mt inhibition at 1-μM Lam-D was similar to that higher concentrations, suggesting robust inhibition efficacy of Lam-D in contrast to the poor inhibition efficiency of CPT (Seol et al., 2012). Together, the gel-based religation assays (Fig. 1C) and the single-molecule measurements (Fig. 2) demonstrate that Lam-D interferes with Top1mt activity both by inhibiting the religation of cleavage complexes and impeding the DNA unwinding activities of Top1mt over a broad range of DNA twist density. Lamellarin D Accumulates Rapidly in Mitochondria and Poisons Top1mt in Cells. To determine whether Lam-D can directly target Top1mt in cells, we took advantage of the fact that Lam-D is intrinsically fluorescent. This enabled us to investigate the intracellular distribution of Lam-D in live cells by confocal microscopy. After Lam-D treatment of SK-MEL-5 melanoma cells, which we chose for this study because they possess large mitochondria, we observed prominent Lam-D cytoplasmic staining coinciding with mitochondria (Fig. 3). Localization of Lam-D to mitochondria was verified by co-localization with the mitochondria-specific dye MitoTracker (Fig. 3A, top panels). As shown in the magnified image (bottom panel, Fig. 3A), and in the correlation between the pixel intensities along a line in the two channels (Fig. 3B), the fluorescent intensity distribution of Lam-D coincides with that of mitochondria. These results demonstrate that Lam-D penetrates and accumulates preferentially in mitochondria within 5–30 minutes of drug exposure. Lamellarin D accumulates preferentially inside mitochondria. (A) Representative confocal images demonstrating prominent cytoplasmic and mitochondrial staining of Lam-D in SK-MEL-5 melanoma cells, monitored by the intrinsic fluorescence (blue channel, left and right panels) of Lam-D, which co-localizes with MitoTracker (red channel, middle and right panels). Right panels show the merged images. The lower panels are expanded views of the boxed images in the upper panels. (B) Quantitation of the pixel intensity of fluorescence along with the arrow indicated in the expanded view of the merged image. The arrow was drawn arbitrarily over a section of interest. Next, we tested the trapping of Top1mt cleavage complexes in Lam-D-treated cells using the ICE assay (immuno-complex of enzyme assay). This technique allows the detection of topoisomerases covalently linked to DNA by immunoblotting after isolation of cellular DNA (Subramanian et al., 1995; Takebayashi et al., 1999; Antony et al., 2007). After Lam-D treatment, Top1mt signals were observed in both SK-MEL-5 melanoma cells and NCI_H23 lung cancer cells (Fig. 4, A and B, respectively). The induction of Top1mt-mtDNA complexes by Lam-D was concentration- and time-dependent; time-course analysis showed that Lam-D induced Top1mt-mtDNA complexes within 1 hour (Fig. 4C), which is consistent with the rapid accumulation of Lam-D in mitochondria (Fig. 3 and above). We also tested whether trapping of Top1mt-mtDNA cleavage complexes by Lam-D damaged mtDNA using long-range PCR, a well-established method to evaluate mtDNA damage (Das et al., 2010). Accordingly, we observed a Lam-D concentration-dependent reduction in long-range PCR product (Fig. 4, D and E), confirming the damaging effect of Lam-D on mtDNA. Lamellarin D traps Top1mt in human cells. (A and B) Top1mt cleavage complexes in melanoma SK-MEL-5 and lung carcinoma NCI_H23 cells treated with Lam-D for 3 hours, respectively. (C) Time course of Top1mtcc after Lam-D treatment at 10 μM in SK-MEL-5 cells. Top1mtcc were detected by ICE bioassay. (D) Induction of mtDNA damage. Representative agarose gel images of mtDNA long- and short-fragment PCR (Long F PCR and Short F PCR, respectively) in SK-MEL-5 cells treated with Lam-D for 24 hours. (E) Quantification of mtDNA damage using the ratio of the long versus short fragment PCR products (Tukey’s multiple comparison test; **P < 0.01 and ***P < 0.001). (F) Specificity of the Top1mt and Top1 antibodies demonstrated by a representative Western blot with recombinant Top1mt and Top1 blotted with Top1mt antibody (left panel) and Top1 antibody (right panel). (G) Comparison of Top1mtcc induced by CPT and Lam-D. (H) Comparison of nuclear Top1cc induced by CPT and Lam-D under similar conditions. Because Lam-D has previously been shown to also trap nuclear Top1 (Facompre et al., 2003), we compared the relative activity of Lam-D on the mitochondrial versus nuclear genome. For this, we took advantage of the fact that our Top1mt antibodies do not cross-react with nuclear Top1, and that the monoclonal C21 Top1 antibody does not cross-react against Top1mt (Fig. 4F). Figure 4, G and H, shows that Lam-D is more potent at trapping Top1mt-mtDNA cleavage complexes than camptothecin (Fig. 4G). On the other hand, CPT is more potent at trapping nuclear Top1 than Lam-D (Fig. 4H), which is consistent with lower accumulation of Lam-D in the cell nucleus than in mitochondria (see Fig. 3 and above). Cells typically contain hundreds to thousands of copies of mtDNA. Replication of mtDNA is independent of nuclear DNA synthesis and occurs throughout all phases of the cell cycle including in postmitotic cells (Clayton, 1991). DNA polymerase gamma and mitochondrial transcription factor A are two essential proteins for replication and maintenance of mammalian mtDNA. Some drugs have been reported to deplete mitochondrial DNA by interfering with mitochondrial DNA polymerase gamma activity (Rowe et al., 2001; Neuzil et al., 2013). Top1mt is also important for mitochondrial homeostasis (Douarre et al., 2012), mtDNA replication (Zhang and Pommier, 2008), mtDNA transcription (Sobek et al., 2013), and mtDNA integrity (Medikayala et al., 2011). Yet, there are no drugs known to specifically target Top1mt. In this study, we provide evidence that Lam-D targets and efficiently inhibits Top1mt by trapping the normally transient Top1mt-DNA cleavage complexes. Trapping of Top1mt cleavage complexes was observed in both biochemical (Figs. 1 and 2) and cellular assays (Fig. 4). 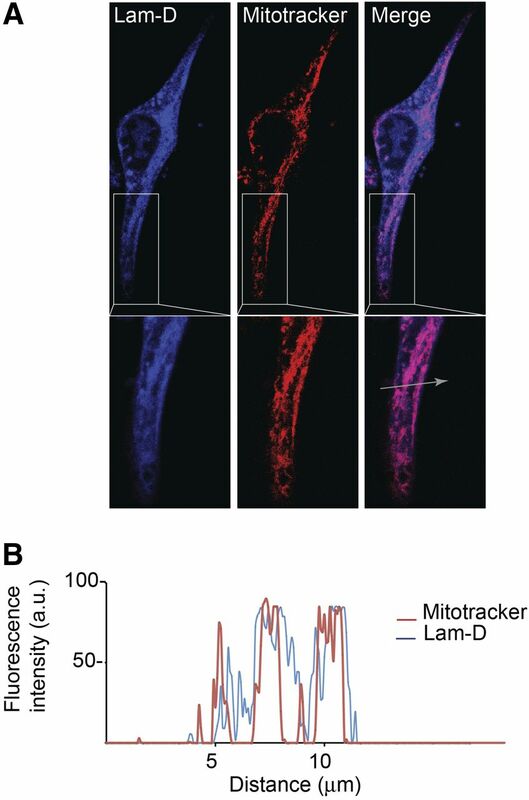 Furthermore, confocal imaging demonstrates that Lam-D accumulates rapidly (5–30 minutes) in mitochondria (Fig. 3), consistent with Lam-D-induced mitochondrial alterations (Kluza et al., 2006; Ballot et al., 2009; Ballot et al., 2010). In particular, Ballot et al. described a Lam-D-induced mitochondrial cascade involving: inhibition of complex III, decreased zeta potential, swelling of mitochondrial matrix, and apoptosis. Our work reveals that Top1mt is a new direct mitochondrial target of Lam-D. The general mechanism of inhibition of Top1mt by Lam-D appears to be similar to that of CPT. Yet, the detailed molecular interactions appear to differ somewhat as the sequence-dependent cleavage patterns between CPT and Lam-D show differences (Fig. 1), and Lam-D is a more robust inhibitor of Top1mt compared with CPT (Fig. 2) (Seol et al., 2012). Although a significant decrease in supercoil relaxation rate was identified as a signature aspect of CPT inhibition of nuclear Top1 (Koster et al., 2007; Seol et al., 2012), our study reveals that religation inhibition by Lam-D is not absolutely associated with a decrease in supercoil relaxation rate (Fig. 2). This implies that DNA damage attributable to topoisomerase I inhibition may not always be associated with hindering positive supercoil relaxation and subsequent accumulation of positive supercoils, as previously suggested (Koster et al., 2007; Ray Chaudhuri et al., 2012). Nuclear Top1 has proven to be a successful target for anticancer drugs. Indeed, accumulation of Top1cc after Top1-inhibitor treatment leads to DNA lesions and ultimately triggers apoptosis and cell death (Hsiang et al., 1985; Covey et al., 1989; Tanizawa et al., 1994; Pommier et al., 2010, 2013). In our study we show that treating cells with Lam-D results in both the trapping of Top1mt on, and significant damage to, mtDNA (Fig. 4). These findings suggest a direct role of Top1mt trapping in the generation of mtDNA damage as an alternative, or in addition, to damage resulting from mitochondrial defects reported by Ballot et al. (2009, 2010). Several studies have demonstrated that mtDNA mutations are common in cancer (Lu et al., 2009) and numerous polymorphisms and mutations of mtDNA correlate with an increased risk of developing malignancies, including breast (Canter et al., 2005) and prostate cancers (Petros et al., 2005). Moreover, recent evidence revealed that mtDNA amounts regulate response to chemotherapy (Singh et al., 1999; Naito et al., 2008; Hsu et al., 2010). Different strategies have been reported for targeting drugs to mitochondria (Heller et al., 2012; Yousif et al., 2009), including nanoparticles (Marrache and Dhar, 2012). Recently, the two most used anticancer agents, cisplatin (Wisnovsky et al., 2013) and doxorubicin (Chamberlain et al., 2013), have been targeted to mitochondrial DNA. 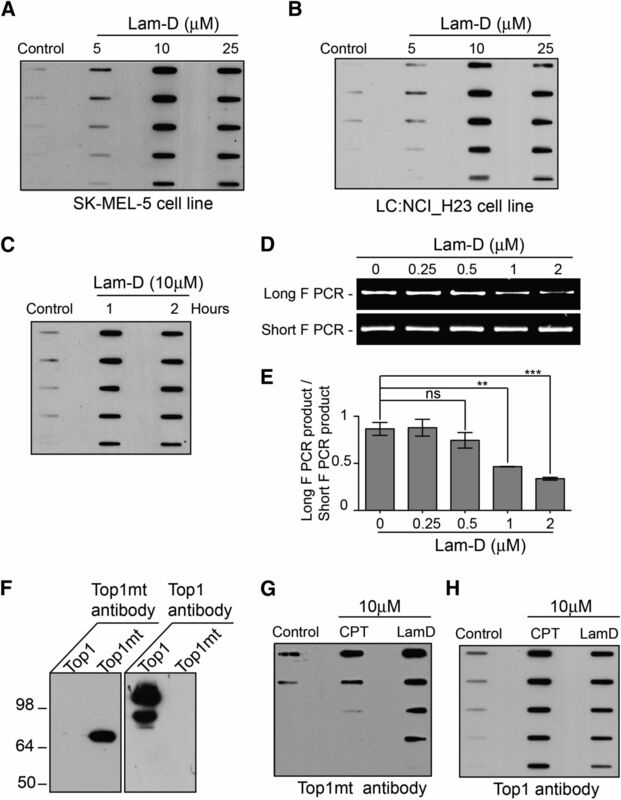 The robust Top1mt inhibition activity of Lam-D displayed in our study suggests that Lam-D can be potentially used as an anticancer reagent targeted to Top1mt in mitochondria. In summary, our study demonstrates that the marine alkaloid lamellarin D is the first drug to target mitochondrial DNA by trapping Top1mt cleavage intermediates (Top1mt cleavage complexes) and suggests that developing Top1mt inhibitors could be an alternative strategy for targeting mitochondrial DNA. The authors thank Dr. Carmen Cuevas Marchante and José M. Fernandez Sousa-Faro, PharmaMar, for providing lamellarin D.
Participated in research design: Khiati, Seol, Agama, Dalla Rosa, Zhang, Neuman, Pommier. Conducted experiments: Khiati, Seol, Agama, Agrawal, Fesen. Performed data analysis: Khiati, Seol, Agama, Dalla Rosa, Neuman, Pommier. Wrote or contributed to the writing of the manuscript: Khiati, Seol, Agama, Dalla Rosa, Neuman, Pommier. This work was supported by the Intramural Research Program of the National Institutes of Health National Cancer Institute, Center of Cancer Research [Z01 BC006161] and the National Heart, Lung, and Blood Institute. (2007) Novel indenoisoquinolines NSC 725776 and NSC 724998 produce persistent topoisomerase I cleavage complexes and overcome multidrug resistance. Cancer Res 67:10397–10405. (2004) Lamellarins, from A to Z: a family of anticancer marine pyrrole alkaloids. Curr Med Chem Anticancer Agents 4:363–378. (2009) Essential role of mitochondria in apoptosis of cancer cells induced by the marine alkaloid Lamellarin D. Mol Cancer Ther 8:3307–3317. (2010) Inhibition of mitochondrial respiration mediates apoptosis induced by the anti-tumoral alkaloid lamellarin D. Apoptosis 15:769–781. (1994) The structural basis of camptothecin interactions with human serum albumin: impact on drug stability. J Med Chem 37:40–46. (2005) Mitochondrial DNA G10398A polymorphism and invasive breast cancer in African-American women. Cancer Res 65:8028–8033. (2013) Targeted delivery of doxorubicin to mitochondria. ACS Chem Biol 8:1389–1395. (2013) Mitochondrial genetics. Br Med Bull 106:135–159. (1991) Replication and transcription of vertebrate mitochondrial DNA. Annu Rev Cell Biol 7:453–478. (1989) Protein-linked DNA strand breaks induced in mammalian cells by camptothecin, an inhibitor of topoisomerase I. Cancer Res 49:5016–5022. (2010) Role of tyrosyl-DNA phosphodiesterase (TDP1) in mitochondria. Proc Natl Acad Sci USA 107:19790–19795. (2008) DNA cleavage assay for the identification of topoisomerase I inhibitors. Nat Protoc 3:1736–1750. (2012) Mitochondrial topoisomerase I is critical for mitochondrial integrity and cellular energy metabolism. PLoS ONE 7:e41094. (2003) Lamellarin D: a novel potent inhibitor of topoisomerase I. Cancer Res 63:7392–7399. (2011) The geometry of DNA supercoils modulates the DNA cleavage activity of human topoisomerase I. Nucleic Acids Res 39:1014–1022. (2012) Mitochondrial DNA and disease. J Pathol 226:274–286. (2012) Targeting drugs to mitochondria. Eur J Pharm Biopharm 82:1–18. (2010) Mitochondrial DNA content as a potential marker to predict response to anthracycline in breast cancer patients. Breast J 16:264–270. (2010) The QPCR assay for analysis of mitochondrial DNA damage, repair, and relative copy number. Methods 51:444–451. (2005) Synthesis and mechanism of action studies of a series of norindenoisoquinoline topoisomerase I poisons reveal an inhibitor with a flipped orientation in the ternary DNA-enzyme-inhibitor complex as determined by X-ray crystallographic analysis. J Med Chem 48:4803–4814. (2006) Cancer cell mitochondria are direct proapoptotic targets for the marine antitumor drug lamellarin D. Cancer Res 66:3177–3187. (2007) Antitumour drugs impede DNA uncoiling by topoisomerase I. Nature 448:213–217. (2011) Total synthesis of lamellarins D, H, and R and ningalin B. Org Lett 13:312–315. (2003) A truncated form of DNA topoisomerase IIbeta associates with the mtDNA genome in mammalian mitochondria. Eur J Biochem 270:4173–4186. (2009) Implications of mitochondrial DNA mutations and mitochondrial dysfunction in tumorigenesis. Cell Res 19:802–815. (2012) Engineering of blended nanoparticle platform for delivery of mitochondria-acting therapeutics. Proc Natl Acad Sci USA 109:16288–16293. (2011) Chronically elevated glucose compromises myocardial mitochondrial DNA integrity by alteration of mitochondrial topoisomerase function. Am J Physiol Cell Physiol 300:C338–C348. (2008) Induction of acquired resistance to antiestrogen by reversible mitochondrial DNA depletion in breast cancer cell line. Int J Cancer 122:1506–1511. (2013) Classification of mitocans, anti-cancer drugs acting on mitochondria. Mitochondrion 13:199–208. (2013) Mitochondria as a pharmacological target: magnum overview. IUBMB Life 65:273–281. (2005) mtDNA mutations increase tumorigenicity in prostate cancer. Proc Natl Acad Sci USA 102:719–724. (2008) Recent advances in lamellarin alkaloids: isolation, synthesis and activity. Anticancer Agents Med Chem 8:746–760. (2013) Drugging topoisomerases: lessons and challenges. ACS Chem Biol 8:82–95. (2010) DNA topoisomerases and their poisoning by anticancer and antibacterial drugs. Chem Biol 17:421–433. (2012) Interfacial inhibitors: targeting macromolecular complexes. Nat Rev Drug Discov 11:25–36. (1999) Induction of reversible complexes between eukaryotic DNA topoisomerase I and DNA-containing oxidative base damages. 7, 8-dihydro-8-oxoguanine and 5-hydroxycytosine. J Biol Chem 274:8516–8523. (2012) Topoisomerase I poisoning results in PARP-mediated replication fork reversal. Nat Struct Mol Biol 19:417–423. (2001) Mitochondrial DNA metabolism targeting drugs. Adv Drug Deliv Rev 49:175–187. (2012) A kinetic clutch governs religation by type IB topoisomerases and determines camptothecin sensitivity. Proc Natl Acad Sci USA 109:16125–16130. (1999) Mitochondrial DNA determines the cellular response to cancer therapeutic agents. Oncogene 18:6641–6646. Sobek S, Dalla Rosa I, Pommier Y, Bornholz B, Kalfalah F, Zhang H, Wiesner RJ, von Kleist-Retzow JC, Hillebrand F, Schaal H, Mielke C, Christensen MO and Boege F (2013) Negative regulation of mitochondrial transcription by mitochondrial topoisomerase I. Nucleic Acids Res 41:9848–9457. (1998) A model for the mechanism of human topoisomerase I. Science 279:1534–1541. (1995) Analysis of topoisomerase I/DNA complexes in patients administered topotecan. Cancer Res 55:2097–2103. (1999) Poisoning of human DNA topoisomerase I by ecteinascidin 743, an anticancer drug that selectively alkylates DNA in the minor groove. Proc Natl Acad Sci USA 96:7196–7201. (1994) Comparison of topoisomerase I inhibition, DNA damage, and cytotoxicity of camptothecin derivatives presently in clinical trials. J Natl Cancer Inst 86:836–842. (2002) Dual localization of human DNA topoisomerase IIIalpha to mitochondria and nucleus. Proc Natl Acad Sci USA 99:12114–12119. (2013) Targeting mitochondrial DNA with a platinum-based anticancer agent. Chem Biol 20:1323–1328. (2009) Targeting mitochondria with organelle-specific compounds: strategies and applications. ChemBioChem 10:1939–1950. (2001) Human mitochondrial topoisomerase I. Proc Natl Acad Sci USA 98:10608–10613. (2008) Mitochondrial topoisomerase I sites in the regulatory D-loop region of mitochondrial DNA. Biochemistry 47:11196–11203.